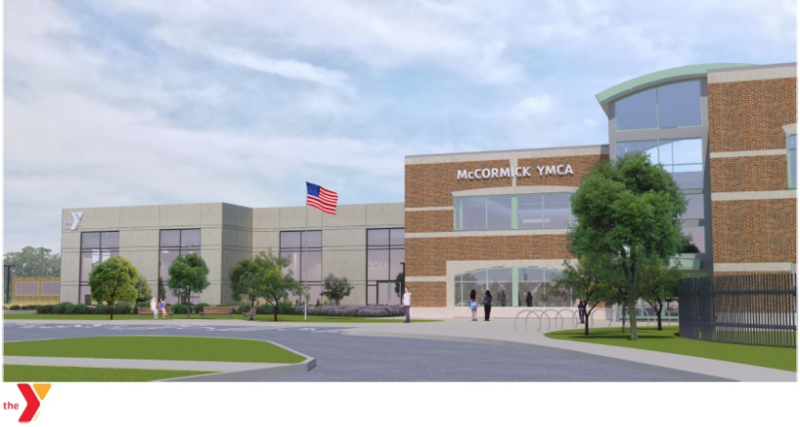 This Summer, Chicago broke ground on the McCormick YMCA Expansion Project. The new two-story addition boasts an Aquatic Center, family locker rooms, and public restrooms to an underserved community in Chicago. A ground breaking ceremony was held this Summer welcoming residents of Humboldt Park, Wicker Park, and Logan Square. Once the blue ribbon was cut and commemorative gold shovels were polished, city officials rushed to the next “Building Chicago” photo-op. It was time for the real work to begin. General Contractor Power Construction Superintendent, Gary Glade, was tasked to deliver the new facility on a strict deadline. To meet the needs, Gary implemented a Pull Planning approach to construction. The methodology relies on lean principles emphasizing cross-collaboration between subcontractors to optimize overlap and shrink layover. Power Construction elected to utilize materials cast off site in an effort to minimize time on site. A nod to families across the street who don’t always appreciate a 7:00 AM Saturday start. Precast Panel supplier, ATMI Precast, is no stranger to big cranes. Solid concrete walls almost always require heavy lifting equipment and erecting partner Waubonsee Development has a slew of rigs working throughout the midwest. The confined job site is lined with power lines, the new facility’s footprint is irregular, and the neighboring foundation wall is supporting 100,000 lbs of water for a seniors aerobics class. An All-Terrain Crane with maximum lifting capability was needed. La Grange Crane sat down with ATMI Senior Project Manager, Ken Graef, Waubonsee PM, Mark Arseneau, and Power Super, Gary, to devise a three-phase erection plan. The GMK 7550 was built with a full load of counterweight, mega wing, and heavy duty jib extension. Ridgeway Avenue was shut down to accommodate a string of delivery trucks. At 7:00 AM, La Grange Crane Operator, Curt Read, promptly hooked into his first pick and didn’t stop until the neighborhood had a new after-school hang out. Weeks later, La Grange Crane would set the HVAC units with CT Mechanical, and return once more to cap off the final panel outside. Today, the pool is poured and the Winter work is moving indoors for a sprint toward a Spring delivery. The Pull Approach is a fine way to run a job site. But when it comes to flipping panel, it might be easier to just drive the crane out instead.